Your cat will love the FurHaven Tiger Tough Floor-to-Ceiling Cat Ladder Playground! 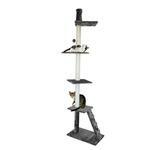 The Tiger Tough Floor-to-Ceiling Cat Ladder Playground features five levels to play on, and includes a soft hammock perch, cat ladder, and a spring-y ball wand toy. The bottom base is large and sturdy, and an adjustable spring brace at the top attaches against your ceiling (up to 10’6”) to keep this cat furniture stable and secure. Your cat or kitten will love climbing up the cat ladder to play on the three cat shelves, and when ready to rest, they can cuddle up on fourth shelf at the top which is a soft cat hammock! 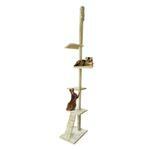 This cat tree is covered in a durable attractive fabric, and has posts covered in sisal rope for their scratching enjoyment and cat-scratch training. 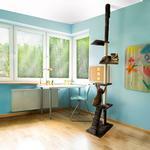 The Floor-to-Ceiling Cat Ladder Playground is easy to clean by spot-washing with a damp cloth and vacuuming it when needed. My experience was great...thank you so much for putting the customer 1st!